Wunderlist has been my to-do application for several months. I like it a lot and my wife has put up with it, so we’ll probably keep using it for the foreseeable future. One feature that I especially make use of is recurring events. I’m one of those people that uses a full to-do list as motivation to keep the day moving. Left to my own devices I can sit quietly in my chair and let hours float by while I just think. There’s lots of thinking to do. But when I have a full list, it’s a lot less likely I’ll waste my time this way. 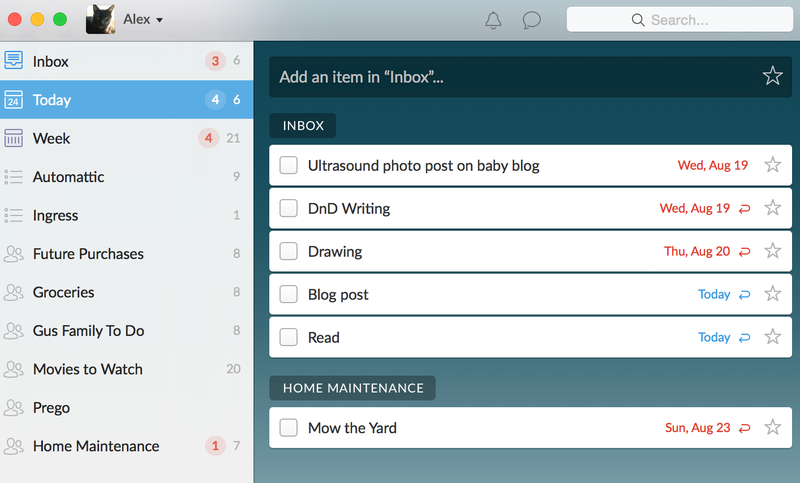 The end result is that I add a due date to almost everything in my Wunderlist so that I can stare at the “Today” smart list instead of into my own mind. The other result is that a lot of my recurring events will go red (ie, late) and stay red for great lengths of time. At the end of the day, a bunch of red tasks still to be done. For instance, learning to draw is a hobby right now. I want to do a little bit everyday, but it’s much lower priority than finishing my work tasks or chores at home. So it hasn’t happened in almost a week. Mowing the yard is important, but I hate doing it and I’m only willing to bother under the right weather conditions and time. So it will probably stay red all the way up until there’s a jungle in my back yard. The unfortunate result of these red items is guilt. I can work very hard all day, cross lots of items off my list, and still feel like I’m not getting traction. At what point do you declare to-do bankruptcy to get rid of all this to-do debt? Answers and any other to-do ideas are welcome in the comments. I’m loath to add due dates to items unless absolutely necessary. Helps me tame the to do beast. So do you just avoid the smart lists entirely? I use Todoist. I mostly break things down by Personal/Work and my site-related tasks. There is tagging and more advanced functionality, but I usually stick with the basics.